We live in a time of paradox. A fast paced global job market dictates that most people should enter the workforce with at least a bachelor’s degree to get off the starting block. However, getting said degree is to begin your life with a mountain of virtually inescapable debt that can put your finances on the back foot before you’ve even begun to make a living for yourself. Most undergraduates fear graduating with a whole heap of debt and no job at the end of it, and while there’s no denying that today’s students have the deck stacked against them the problem of graduate debt is not insurmountable. Graduate debt… a fact of life, or an economic bomb waiting to go off? Many regard student debt as an unfortunate expense of trying to better one’s self through education- an aspiration tax, if you will. The fact is, however, that the problem of graduate debt is a 1.3 trillion dollar bomb just waiting to go off. We’ve created a climate where financial standing, rather than academic merit, is the the deciding factor in which colleges prospective undergraduate or graduate students are able to attend. We, as a nation, pay more towards student debt than to credit cards and auto loans. 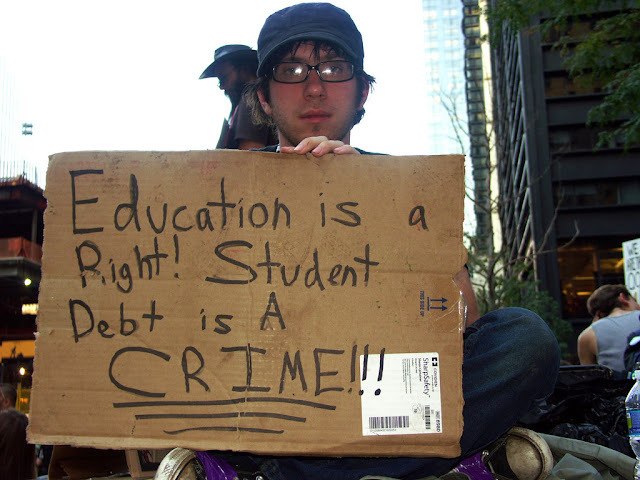 44.2 million Americans are currently grappling with student debt and as of last year the default rate is 11.2%. Nothing about that paints a healthy picture, and the long-term macroeconomic effects if things keep going in this way have yet to be fully explored. Perhaps the most telling and damning statistics are that student debt was a factor for 10% of students in delaying life choices like getting married or buying a house while 20% said that their debt influenced their employment plans, causing them to take a job outside of their chosen field or work multiple jobs. It’s understandable that many graduate from college and wonder if it was all worth it. While learning and study are their own rewards, the disparity between the job prospects freshmen expect to face upon enrolment and those they experience upon graduating can be extremely disheartening. If you’re struggling to pay off your undergraduate debt it can be tricky, but juggling it alongside post-graduate debt for a Masters degree or PhD can be a nightmare. Fortunately, the financial market has responded to graduate debt with a range of options. Federal student loan consolidation (also referred to as refinancing) is a valuable resource for those managing different debts from different colleges with different repayment schedules and interest rates. This takes a little of the psychological stress out of your student debt and ensures that you don’t end up overpaying on interest. You may also be eligible for Student Loan Forgiveness, whereby your debt balance is ‘forgiven’ provided you have made 120 monthly payments to a qualifying repayment program while working full time (provided you work for a qualifying employer). Graduate debt is an economic problem… But it’s not one that seems to be going anywhere any time soon. But through careful management, your student debt needn’t be a cross to bear throughout your working life. I think that if it is a better level of education, like the one at Oxford for example, than you do have to pay for the educational level you get. The prices for the tuition seem justified as well because professors need to make money to support their families. On the other hand, you can always choose online learning and get college research papers online, whereas not every college allows that. This is the question of choice, you can study online for smaller prices, or you can wind up with a huge debt at a regular school.